In spite of intensive efforts and significant progress in the area of occupational safety, the Chinese coal industry is still a relatively dangerous environment to work in. 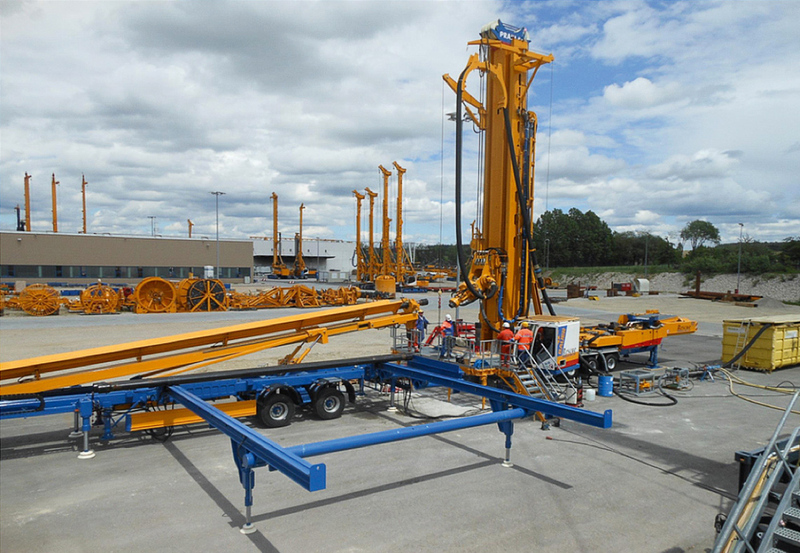 As well as introducing a large number of operational and organisational measures, the China National Coal Development Company took another step towards improving passive safety in 2012 by ordering six German-built rigs for drilling rescue boreholes. The sinking of rescue holes for evacuating trapped mineworkers has already saved many lives around the world, as confirmed by spectacular successes such as the ‘miracle of Lengede’ and the more recent rescue mission in Chile. Yet there is still no organised system that lays down the procedures to be followed in the event of a mining accident. The Chinese coal industry now faces the challenge of using the available drilling technology to develop the rescue-hole technique as a systematic instrument with clearly defined objectives and results that can be replicated at any time and at any place. This paper will attempt to outline the options for developing such a system. The Chinese national economy consumed nearly four billion tonnes (bn t) of coal in 2012 (1). Of this total, 3.6 bn t were produced at home and 230 mill. t were imported, mainly from Australia. China has a population of 1.35 billion people, which means that every inhabitant uses about 2.83 t of coal a year. Germany was once the most important coal producer in Europe and its coal was the ‘black gold’ that fuelled the economic miracle. Peak production was achieved at the end of the 1950s when West Germany’s three coalfields produced a combined total of 150 mill. t. With 35 mill. t being exported this left some 115 mill. t for domestic consumption (2). As the then Federal Republic had a population of about 55 million, the specific consumption per person per year can be rated at about 2.1 t, which is 26% less than China consumes today. These figures also provide some indication of the scale at which the Chinese coal industry is now operating. China’s coalfields are mainly located in the east and north-west of the country and cover an area that is much larger than the whole of Europe. There were approximately 12,000 active mines in 2012 (3), though the exact figure is not known as there are thought to be thousands of mines operating illegally that produce just a few thousand tonnes of coal a year for local households. Safety has been a frequent theme in the international press with reports of mining accidents and large numbers of fatalities. According to official figures there were more than 7,000 fatal accidents in 2000. By 2012 this had fallen to just over 1,000 (4), which indicates a significant improvement. By comparison, the USA, the world’s second-largest coal producer, recorded 54 mining fatalities. The USA produces about 1.0 bn t of coal a year, which means that based on coal output China has more than five times the number of fatal accidents. No reliable figures are available for the Chinese mining industry when it comes to the number of reportable accidents, but here too it has to be assumed that these are at a much higher level than in the USA and Europe. Serious accidents resulting in a number of fatalities can usually be attributed to firedamp, dust or a combination of both (4). Although China does have a number of very modern collieries that in many ways have achieved the same technical standards to be found in American and German mines, the country still has an incredibly large number of pits that are operating with much lower safety standards – and these are responsible for the industry’s high accident rates. The Chinese Government is making real efforts in this area and in 2013 planned to shut down more than 5,000 unsafe mines. In order to exert pressure to improve safety levels instructions were issued to colliery managers that they should visit their own mine workings at least once a week. The impact of this instruction in such a huge country, where distances are on an almost unimaginable scale for Europeans, must sadly be regarded as ‘negligible’ to date. The coal industry’s poor safety record and the media coverage of China’s mining accidents have put that emerging nation under some pressure in international political circles. By the turn of the new millennium China began to investigate the options afforded by rescue borehole technology and it was at this time that the first such machines were purchased in the USA and subsequently tested. From 2009 on talks were held with various potential suppliers with regard to the procurement of a larger number of drilling rigs of this type. These preliminary negotiations included the Peine-based company Prakla Bohrtechnik GmbH, which is a subsidiary of Bauer-Maschinen GmbH of Schrobenhausen. The technical discussions were of an intensive nature but proved extremely protracted because of the complexity involved in designing a universal machine capable of drilling the kind of rescue holes required. And then came the San Jose incident. In the summer of 2010 the eyes of the world were fixed on Chile, where drilling teams were attempting to save 33 trapped mineworkers using a variety of drilling systems. Special drilling equipment was procured from all parts of North and South America and transported to the mine for the rescue operation. The trapped men were located in an emergency shelter some 700 m below ground. There was then a race to see which of the drilling crews could reach the target zone first. After 17 days a team operating a 6.5-inch DTH (down-the-hole) drilling hammer broke through the roof of a spiral roadway about 20 m from the shelter (5). This hole was used to send down emergency supplies to the trapped men, who had lost between 8 and 9 kg in weight. A second borehole of the same diameter was drilled into the shelter and this was then reamed out in two stages, first to 30 cm and then to its final diameter of 71 cm. 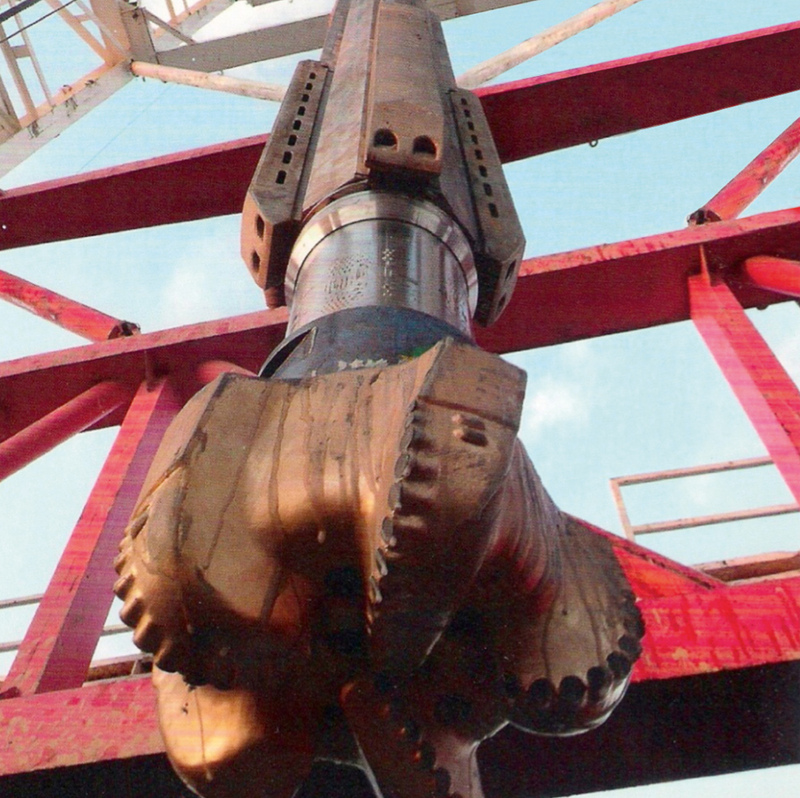 Air-driven DTH drill heads were also used for the reamer drilling, with the drill cuttings falling down through the pilot hole into the underground cavity. This material then had to be loaded away by the men trapped below as it could not remain directly beneath the exit point of the borehole. As is customary in ore mining, LHD vehicles were used for materials transport at San Jose Mine. One of these machines was found close to the drilling point and could be used by the miners to load out the drilling debris. Special containers and cables were used to provide the men with diesel fuel, water, food, oxygen and a communication link, via the first supply borehole. The rescue hole proved extremely stable and there was little or no water inflow from the surrounding strata. Casing only had to be installed in the first 56 m of hole where it passed through the loose surface formations. The mineworkers were ultimately rescued using a modern version of the Dahlbusch bomb. The final miner was lifted out 55 days after the original collapse. This historic success story was followed as a ‘live event’ all over the world. The success of the Chilean rescue mission put huge pressure on those persons and bodies responsible for safety in the Chinese coal industry, especially in view of the safety situation in that country. Discussions on the development of a drilling system specially designed for sinking rescue boreholes were significantly intensified and accelerated. With the Chilean success acting as a spur, the machinery that was being demanded by the Chinese developed increasingly as a copy of the technology that had been deployed so effectively at San Jose Mine. The delegations responsible for the project were keen not to make any mistakes and were careful not to place orders for anything that might fail and lead to questions as to whether the right drilling technology had been employed in the first place. The assumption was that if the equipment chosen was identical to that which had delivered success in Chile then the design team would be protected from personal incrimination. The question of whether drilling conditions in Chile could simply be transferred to those applying in China was not given primary consideration. As the political and social pressure on the decision-making bodies was rising from day to day, the time required to design a specific system and select an appropriate drilling process was not available. Something tangible had to be done and the first drilling machines were to be made available as quickly as possible. Those responsible were convinced in a series of intensive consultations not to purchase the kind of special equipment that was designed only for the down-the-hole hammers used to such great success in Chile. The drilling equipment ultimately chosen comprised universal boring machines that would be capable of undertaking practically any established drilling operation to the given target depth of 800 m.
The dominant and limiting factor for drilling a borehole intended for the rescue of trapped mineworkers from an underground coal mine is time. It is not really possible to give a general answer to the question of what kind of time window will be available for the initial breakthrough to an underground chamber where the trapped miners may have taken refuge. This requires a careful analysis of the local conditions. The fact that the chances of survival diminish significantly after 72 hours should at this point serve as a yardstick for the available time window. Assuming that the chamber containing the trapped miners has no fresh air, no drinking water and no air conditioning, the 72-hour time slot can be regarded as a realistic target. In reality this means that all the technical equipment and operating personnel have to be transported to the site, at least one drill hole has to have reached the target zone and the hole has to be stabilised – all within a period of 72 hours. The first emergency supplies can then be sent down to the trapped miners via this borehole, giving the rescue team a larger time window within which to prepare a second, larger-diameter rescue hole. The rescue operation can therefore be divided up into two separate drilling phases: a smaller borehole for emergency provisions (the supply hole) and a second borehole for the actual rescue. Each of these two holes has specific requirements to meet in respect of time, quality and accuracy. The various tasks and procedures for each borehole drilling operation, which are set out below, do not constitute a concrete and binding set of instructions but rather are to be viewed as considerations of a general, abstract nature. The task of developing a practical sequence of operations designed for the preparation of rescue boreholes for the Chinese coal industry is an extremely complex challenge. Such an assignment will certainly take several years to complete and incur significant costs. The mere fact that that geographical area to be covered extends over thousands of square kilometres makes it impossible to draw up a universally applicable technical manual. An individual concept has to be prepared for each drilling site that takes account of the local geological, mining, geographic, logistic and operational requirements. As already stated, the speed of response in drilling a supply hole will have a decisive impact on the survival prospects of those trapped below ground. This calls for a very precise sequence of measures to be carried out. The success of the rescue mission will depend to a large degree on the availability of a reliable and accurate set of mine drawings detailing the entire underground layout. Immediately after the accident has occurred a team of qualified staff has to be assembled to pinpoint the exact location of the incident and identify possible escape routes for those who have been trapped. Possible drilling points then have to be marked out on the surface, from where the identified target can be reached. Ideally the drilling site will be located vertically above the target zone. However, if the target is located beneath a built-up area, or if the terrain above the target zone is inaccessible for drilling equipment, then alternative drilling sites will have to be selected. These locations will have to be surveyed very accurately and then correlated with the mine plans. The drilling site then has to be made ready for the arrival of the drilling equipment. If specific underground workings have already been identified in advance as rallying points and rescue zones, or if rescue chambers are already in place, potential drilling sites for accessing these zones can then be marked out on a surface map. Then there is no need to identify a precise drilling point under tremendous time pressure in the hectic hours following the accident. Another question to be resolved, in addition to the choice of drilling site, is the type of drilling method to be used for the supply hole. The ideal situation of course is to find a system that can bore quickly and accurately in any type of rock and can maintain the specified drilling diameter. Under favourable conditions this would effectively indicate the same method that was used to achieve the decisive breakthrough in Chile. The use of an air-driven DTH hammer with reverse circulation is the fastest and most accurate of all the non-directional drilling techniques for boring through solid rock. In Chile the successful borehole had a horizontal deviation of about 3.5%, which represents an excellent result given the speed at which the drilling operation had to be executed. However, for a drilling depth of 700 m this also resulted in an actual hole deviation of more than 20 m from the target. In Chile this meant that 17 days after the accident the drill broke through to a large spiral roadway rather than into the targeted rescue chamber. Such a result is unacceptable for the systematic and repeatable drilling of rescue boreholes for the coal mining industry. It is absolutely vital that the first rescue attempt is successful within 72 hours of the alarm being raised, as otherwise there is a marked reduction in the chances of rescuing the trapped miners alive. Because of the enormous vibration levels acting on the drilling tools and drill pipe when boring with compressed-air hammers, MWD equipment (measurement while drilling) and similar systems that the drilling industry normally uses for assessing drilling accuracy cannot be used in this case, as they would be destroyed within a few minutes. In order to check hole alignment drilling work therefore has to be interrupted and the drill pipe withdrawn from the hole so that the measuring equipment can be inserted. Any corrections to the course of the hole can be effected by means of wedges or similar devices. However this process takes up a lot of time, which has to be deducted from the maximum 72 hours available. Neither do the above considerations take account of the fact that the rock encountered during the Chilean rescue was very stable and almost free from water ingress. Conditions of this kind cannot be expected in an area of Carboniferous rock that has been affected by mining operations. Water inflow in particular will hamper the air blast drilling operation in two ways. Firstly, the water influx limits the capability of the air blast drilling system in that it restricts the pneumatic removal of the cuttings. In order to reduce this effect the air pressure has to be increased accordingly. Foaming agents can also be used to some degree to bind the water and support the conveying capacity of the air-foam-solids mixture. The drive to the hammer requires an air pressure of 10 bar for the actual drilling work. For every additional 100 m of water-filled hole another 10 bar of pressure is needed to lift out the water and cuttings. By employing boosters a total pressure of about 70 bar can be developed, this ultimately restricting the technique to a depth of 500 to 600 m below the water table. Secondly, the flow of water into the borehole, and its subsequent inrush into the underground chamber after breakthrough, will present a threat to the trapped miners. DTH hammer drills require an adequate level of rock stability if the air blast drilling operation is to operate successfully. As this technique does not use drilling mud to stabilise the hole, the walls of the borehole must be self-supporting. If this is not the case – and indeed this condition is not usually encountered in Carboniferous strata that are already under the influence of mining activities – then this particular drilling method cannot be successful. In such a case the section of borehole in the affected horizons will have to be cased, or another drilling system must be selected from the outset. Installing pipe casing will impact on the available time window and the hole below the cased section will then have to be drilled to a smaller diameter. Another option is to start off with a larger hole so that the breakthrough into the underground chamber can subsequently be achieved with the specified drilling diameter. This will also increase the drilling time. Rotary drilling with mud flushing is another alternative, though its slow rate of advance and poor directional accuracy would pose problems for this particular application. However this technique could prove very effective if used in combination with directional drilling technology whereby the course of the hole can be logged and corrected as the drilling operation progresses. This system can be used to produce near-vertical boreholes with deviations of less than 0.5 m over 700 m and inclined holes of similar directional accuracy. Figure 2 shows a directional drilling system fitted to a standard rotary drilling head. Figure 3 illustrates the verticality that can be achieved with such a borehole technique. 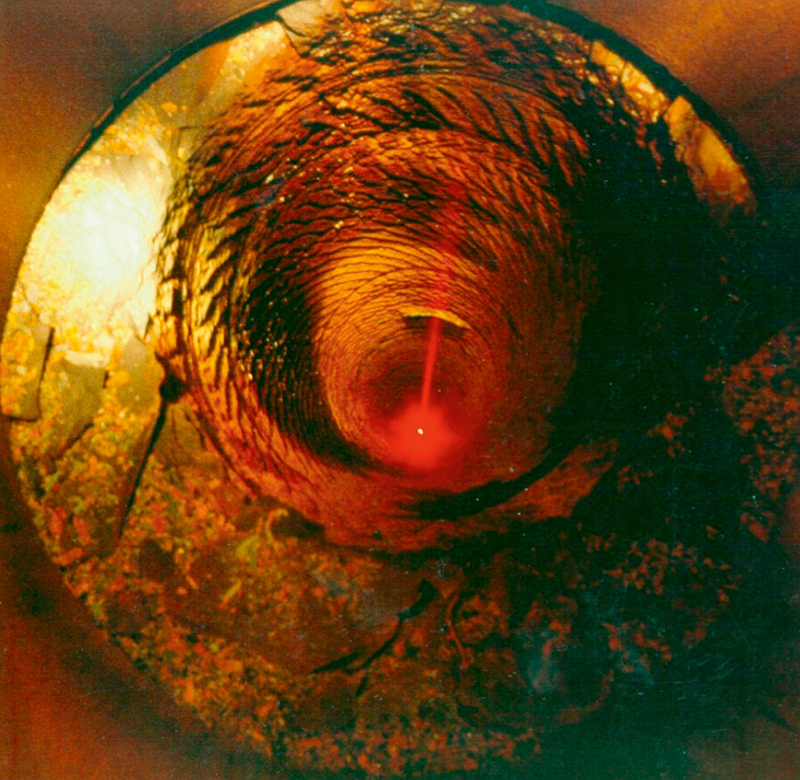 This technology was developed in Germany for operations such as drilling into disused mine workings for gas drainage purposes, and is frequently used to this effect. The practice has now become state-of-the-art in the international oil and gas drilling industry. It does however have several drawbacks, including very high operating costs, a high training and maintenance requirement and extreme demands in respect of the quantity and quality of the drilling fluid. Another factor to be borne in mind is that at the moment of breakthrough the drilling mud in the borehole will flood into the underground chamber. For a 6.5-inch borehole 700 m in length this equates to some 16 m3 of fluid. The extent to which the drilling mud has sealed and stabilised the sides of the hole during the drilling phase, and whether this ‘cake’ remains stable and compact after the release of the drilling fluid, can only be determined by experiment. Otherwise with this method too the ground-water and formation water that has accumulated in the borehole will run out into the mine workings. The ideal drilling system from the point of speed and accuracy is to have a DTH motor driven by the drilling fluid and operating in conjunction with a 3D directional drilling system. A down-the-hole motor is capable of achieving up to five times the drilling speed of normal rotary boring systems and as much as three times that of air-driven hammer drills. The 3D directional drilling system means that any point within the drilling zone can be targeted to an accuracy of 0.2 m over a distance of 700 m. If the mine plans are accurate and the drilling site has been properly surveyed this allows the identified target to be reached within the specified time and to almost 100% accuracy. Many of the aspects mentioned in regard to the drilling of a supply hole will naturally also apply to the sinking of the rescue borehole. The main difference between the two is the diameter required for the second, larger hole. The internal diameter of the rescue borehole is specified at about 700 mm. When planning the rescue hole direct use can be made of the experience acquired when drilling the supply hole. Rock stability, water inflow rates, strata jointing and so on will all be known parameters. More importantly, once communication has been established with the trapped miners, information will become available on the spatial, climatic and hydraulic conditions in that part of the mine. From this it will be possible to establish the target coordinates and accuracy requirements for the rescue borehole. This, along with an analysis of the physical condition of those trapped, can then help define a time window for the completion of the rescue hole and the most appropriate drilling method for the operation. A key factor for rescue operations in China is the aforementioned requirement for a universal drilling rig capable of employing all commonly used drilling methods. The choice of drilling technique can range from various individual methods to a combination of different systems. An initial distinction essentially has to be made between drilling from a pilot hole and drilling from the solid. Drilling with a pilot hole is the preferred method when it comes to speed and accuracy. The pilot hole is drilled first and then reamed out in one or several stages. The hole widening operation is carried out either from the bottom upwards, using the raise boring method, or from the top downwards using roller bits or air blast hammers. In both cases the cuttings will fall down the hole to the bottom cavity, which in the case of a rescue borehole will be the refuge containing the trapped miners. This operational advantage, which makes the pilot-hole method simpler and more effective, therefore also presents a high risk for the rescue mission. In Chile the rescue borehole was drilled using this method with air blast hammers. The entire process, from the supply hole breakthrough to the commencement of the actual rescue operation, took a total of 50 days. There is some real doubt about whether this achievement, despite the reliable supply of food, medicines and water, would have been enough to save the men without the availability of an LHD vehicle. In contrast to the pilot-hole method, drilling from the solid has the particular advantage that the cuttings are transported to the surface. However, the borehole is relatively inaccurate and the course of the hole has to be monitored and corrected at fairly short intervals. The method that appears to be most appropriate can only be identified when information has been obtained as to the situation on the ground, based on the provision and analysis of photographic material and surveys. For the equipment that was to be delivered to China the client specified the same type of drilling system that had yielded success in Chile. 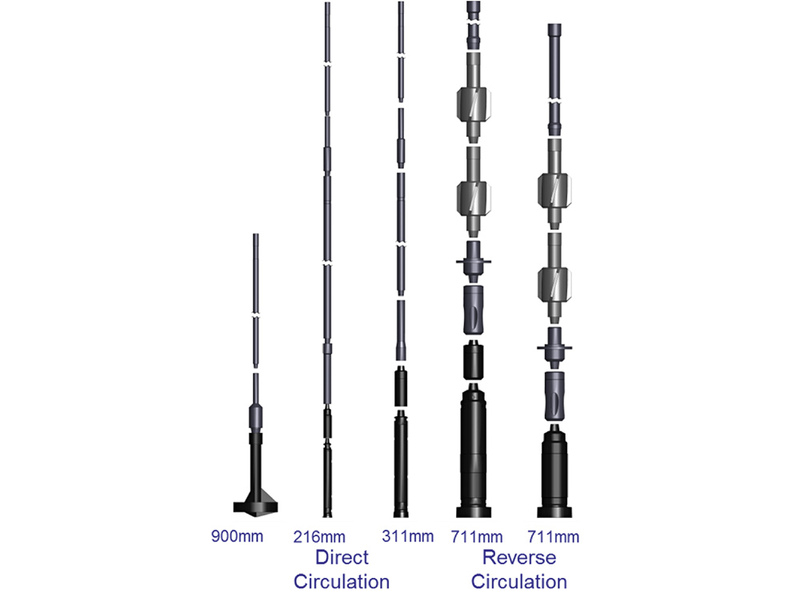 The drilling equipment provided with the installation comprises a 216 mm and a 311 mm DTH drill hammer for direct circulation, along with two different 711 mm DTH drill hammers (Figure 4) one of which is fitted with a bullnose. The 900 mm underreamer shown in Figure 4 left is designed for casing work in loose surface formations and will not be discussed further in this paper. The delivery of six drilling rigs to China for the purpose of undertaking rescue drilling operations constitutes a small first step towards developing a rescue borehole service in that country. The aim of such a service must be to develop the capacity to achieve targeted and repeatable drilling results for the rescue of trapped mineworkers. What was achieved in Chile cannot simply be transferred directly to the conditions prevailing in the Chinese coal industry. In Chile a whole number of favourable conditions came together in such a way that at the end of an unplanned and never to be repeated action the lives of 33 miners could be saved. A professional rescue team with specially developed and assembled equipment will have to meet much higher requirements. There can be no telling either where or when the drilling system ultimately deployed in China will be needed, neither can we know the requirements imposed upon it in terms of drilling speed and accuracy. The success of any mission, and the certainty of a rapid and reliable rescue drilling operation, will depend on having a well-trained rescue team on permanent standby with the capacity to deploy at any time and without restriction the kind of drilling technology required. This will involve not just a single drilling rig but a range of different units for all kinds of drilling methods, along with their associated measuring equipment. For the mine operators this ultimately means that the initial outlay for the drilling equipment and the first basic set of drilling tools will only constitute a small part of the total investment required. ‘Learning by doing’ and paragraph one of Murphy’s Law – ‘expect the unexpected’ – are the ground rules to be observed for a successful rescue drilling service. In practice this means that the personnel who are released from other duties to concentrate on this type of operation have to train with their equipment and drilling tools on a daily basis and under realistic conditions. A large number of boreholes will have to be drilled under similar conditions, with certain specific targets and within a predefined period of time. The holes to be completed as part of this training process do not necessarily have to be practice holes but can in fact have real functions to fulfil. They may for example be well borings, ventilation holes or supply boreholes. The important thing is that the holes are drilled in the same kind of geological conditions that may be encountered in a potential target zone for a rescue borehole. The team will then be able to document their experiences with various operating parameters, such as typical directional deviation, penetration rates, water inflow, hole stability, tool wear, mud pressure and so on, so that this knowledge can be used to good effect in the event of a real rescue mission. Operational readiness must also be ensured on a permanent basis and this will require the development of a competent maintenance programme. This will apply to both the drilling machinery and the various tools and accessories. The drilling rigs and measuring and logging systems must be readily available at all times in sufficient quantities and must also be kept in proper technical working order. In spite of steady improvements in safety standards, the Chinese coal industry is still generally a dangerous environment in which to work. In order to improve passive safety levels the China National Coal Development Company issued an international call for tenders to supply a total of six universal drilling rigs for rescue borehole operations. This equipment was subsequently ordered from Prakla GmbH. The decision to procure this technology as quickly as possible had been triggered by the successful rescue mission undertaken at San Jose mine in Chile. This report seeks to examine the extent to which the successful outcome of the Chilean rescue can be transferred to the conditions prevailing in China’s Carboniferous strata. A crucial factor for setting up a professional rescue drilling service as a systematic instrument with clearly defined aims and an outcome that can be repeated any time and in any location is the capacity to drill an initial supply hole within 72 hours at a maximum deviation of one metre into a potential target zone where the trapped miners are believed to be. Achieving this objective will require the development of a logistically and technically complex rescue drilling service. And a permanent training regime is also needed so that there is a good likelihood of success if and when such an emergency arises.